We made these again last night. 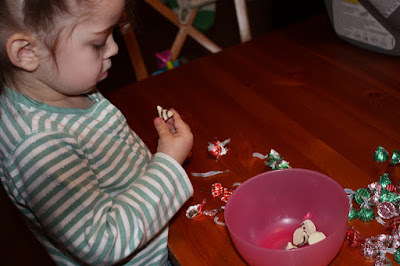 When Zizza was just over two she unwrapped hugs and put them obediently in the bowl, eating only the few we granted permission for. 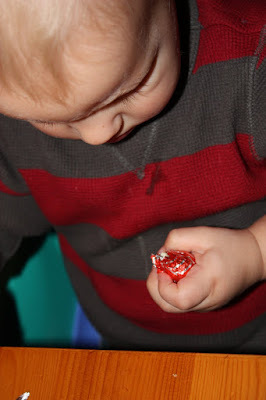 At just a few months under two Enz ate every candy placed within his reach. How much of this has to do with the months age difference and how much is the difference in the children, do you think? Zizza took her responsibilities very seriously. She’s an old pro at this now, it’s her third year on the job. She even gave me a few pointers. Then Enzo ate up the broken pretzels while Zizza and I placed the hugs on their unbroken brothers…and I didn’t take any photos of the finished product. They look the same as they did last year. Check that link up yonder if you want to see.